Oh! 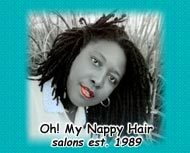 My Nappy Hair Salons are happy to announce a new social connection within the Oh! My Nappy Hair house. This new connection will be called Bridging the Naps. The salons in Oakland, California, and Atlanta, Georgia all will be participating. Bridging the Naps came about because I feel that we as humans have forgotten how to embrace each other as we rush through life. We go to work, and home, we deal with our families and a select few people we call friends. Sometime you just might simply want or need a "hug" or "handshake", or to simply be a part of a stimulating conversation. Perhaps you just want to listen, exchange views with someone who hasn't heard them yet, talk about something that is bothering you -- whatever. You don't have to get your hair done here to be a part of Bridging the Naps. We believe that we are all cells within the body of God. Bridging the Naps will acknowledge the fact that "Goodness Begets Goodness."